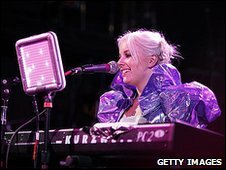 Synth-pop singer Little Boots started the year at the top of the BBC Sound of 2009 list after being named the brightest new star in a survey of UK critics, DJs and other music experts. A year later, her 200,000 album sales, top 10 single, ubiquitous media presence and non-stop schedule point to a good year in Little Boots' world. Early followers were attracted by her Kylie-meets-Saint Etienne cosmic disco and a persona that was part teen-friendly pop idol, part savvy singer-songwriter and part electro dance queen. Her career got off to a stuttering start when debut single New In Town misfired, but the floor-filling follow-up Remedy proved to be her biggest hit, spending a month in the top 10. At the same time, Little Boots, aka Victoria Hesketh, has perfected her red carpet pose, appearing at events from royal film premieres to turning on Christmas lights with Bob Hoskins. In the coming year, she will try to crack the US market, where her album Hands is out in the spring, as well as starting work on the follow-up. When you're Grandma Boots, knitting dayglo ankle warmers in your rocking chair, how will you look back on 2009? Probably just the maddest year of my life. It feels like 10 years - it feels so intense. It's been an onslaught of everything at once - so many amazing things and so many emotions. You've been in demand and attended a lot of events - has anything you've done made you cringe? I only really go to events if it's something I want to see - I went to the royal film premiere because I really wanted to see that film, or the launch of a book I really liked. I don't really go to the ones that are for the sake of it. I find that a bit weird, people just going to things to be seen. I find some of the celebby stuff a bit weird and I feel a bit out of place. What's the strangest situation you've found yourself in? When we were at South By Southwest [festival in Texas], Kanye West came down and I was on stage with Kid Cudi doing this bizarre song out of nowhere, which was quite weird. We did a sold out tour of the States, then I came back for 48 hours, shot a video in London, then flew to Australia and did another two-week tour. There are things that you don't think are physically possible, but you have to do them. How do you feel about winning the BBC Sound of 2009 now? Sound of 2009 opened a lot of doors for me and some amazing opportunities that I was really really grateful for. But it did put a huge amount of expectation on the album. When I found out I'd won last year, I hadn't even finished the album - I was in LA frantically trying to finish it. It can be hard. It's funny - all the new artists want to be in [the Sound Of... list] but once you are, you've got to accept that everyone's going to have their eye on you. But maybe it's good to try to live up to that. It's better to have people talking about you than not talking about you. Given the expectation, how do you feel about how the album and singles went on to do? I was really pleased. This time last year, I would never have even dared dream I'd have a gold record and have been in the top 10 or top five or even the top 100. At the start, was there any pressure from people around you to be a certain type of artist? At the start there wasn't because at the start it was just me. But then when it got a bit further down the line, you're trying to play these funny games. There are a lot of games and rules and industry stuff. I've always felt completely in control of that but some people [ask]: "Well is it a blonde shiny pop star or is it a songwriter and studio-y person?" They can't marry those things in their heads and people always wanted to make me one or the other. I like that I'm both and neither. I've always loved both of these things. Is 2010 going to be the same again, but in the US? Some of it is. The album comes out in March in America. We've got some big tours booked. It will feel quite weird because this feels like closure at the end of the year, but out there it's not even started. I'm just full of ideas for the next one now. There's a few other things I might do as well - non-music stuff - just to clear my head a bit. I really need a clean break before I get writing again so I'm talking about doing some fashion and literary stuff. You wrote on your blog about Vogue airbrushing your photos - how do you feel about that? Everyone does it. It is a bit funny seeing your legs half the size that they normally are. I'm quite small anyway, I don't see why they have to make me even smaller. With the whole weight thing, you've just got to be happy with who you are. There is a lot of pressure from magazines. Even when I go to parties and I can't see people when they turn sideways, you think, oh my God, I'm the biggest person in the room. But I don't really care. I'm not a model, I'm a musician. I don't need to be a size four. Little Boots was speaking to BBC News music reporter Ian Youngs.